08:09 pm - Takarazuka; Dream Come True. 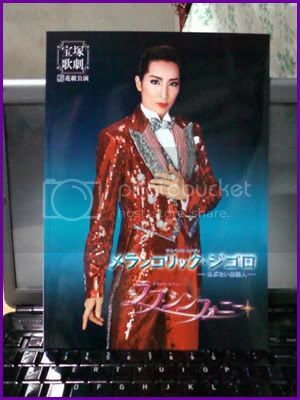 On September 13th, 2007 I posted my first journal entry on Takarazuka. On September 16th, 2010 (almost exactly 3 years later) I had in my hands my first tickets to my first Takarazuka show. On December 8th, 2010, my dream of seeing these lovely ladies in action finally became a reality. You know how sometimes you expect something to be really amazing, you think it'll be wonderful, mesmerizing, perfect, beyond-words-can-describe incredible that when the times comes for the actual thing you think to yourself it can't possibly be as amazing as the standard you've set for it in your head? Yeah, that's how I felt this morning heading to the theatre. I thought I've been dreaming of seeing these ladies live for 3 years now, 3 years of thinking how perfect they are, the singing, the dancing, the stories, the everything, there's no way the actual experience could be as great as I imagined. Except they proved me wrong...boy did they ever prove me wrong. Almost 3 hours of being in a dreamlike trance, gazing up at that stage where people I had only adored through the tv screen came to life. They sang, they danced, they were only a few metres from me and sometimes came so close I could reach out and touch them. I thought since I'd seen the DVDs it wouldn't be such a big deal. I mean with the DVD you get closeups, the camera zooms in on who and where you should focus on, in the theatre there's no way you can see in such detail, but just the whole atmosphere was incredibly. I must have had the stupidest smile on my face through the entire thing, and my heart was beating like no tomorrow. Three times Matobu Sei came into the audience, going into the aisles, twice shaking hands with people, dancing and singing as she went, once she was joined by Sou Kazuho Hana Ranno, and a bunch of the siennes, all dancing and singing in the aisles. My friend and her daughter actually managed to shake Matobu Sei's hand as she went, and we were giggling like crazy schoolgirls. Even now, a mere 3 hours after the show I already feel like it was a dream. All that glitz and glamor of a few hours ago, it seemed like no way could I have actually seen it live. I think I'm in big trouble because now I feel like I MUST see another show, I absolutely MUST, MUST, MUST. Next year, though they probably won't be coming to Nagasaki again since their national tours come around only two or three years, I MUST go see them in Hakata at least! The photo above is the booklet I bought for the show I saw. Initially I wasn't sure I wanted to get it but then I figured it was only about 1,000Yen (~$10) and I needed SOMETHING to commemorate my first time seeing a show live, plus just the experience alone made it worthwhile. The passion with which you describe that show is fascinating... Really makes me want to have been there and watched it too.